I sold some unused spinning accessories for my Baynes wheel today. (As a side note, spinners are awesome people, and as I have been the recipient of awesome spinning karma in the past, I reached out and passed some along with my offer to sell the jumbo flyer and bobbins I’ll never use for this wheel, and made a spinner very happy.) I had just finalized the price with the buyer, and the e-mail from Paypal confirming that she’d paid me arrived. Four seconds later, the e-mail from WEBS announcing that they’re now carrying Malabrigo Nube spinning fibre lands in my inbox. Coincidence? I THINK NOT. Curse you, WEBS. Curse you and your spying, tempty ways. In other news, I spun stuff and dyed other stuff. Like this 325 yards of superwash merino for a somewhat secret project. Lovely, springy yarn, about a DK weight (a bit lighter than I was aiming for), spun longdraw on the Baynes Colonial upright wheel from faux rolags rolled from 4 oz of commercial SW merino top, and then chain-plied. I’ll probably have to cut my yarn when I get to the few super-thin bits you can see in the skein, remove the thin part, and reattach the thicker stuff to knit again. That can be a problem with chain-plying; it tends to magnify a variance in grist instead of evening it out, the way a true three-ply does. 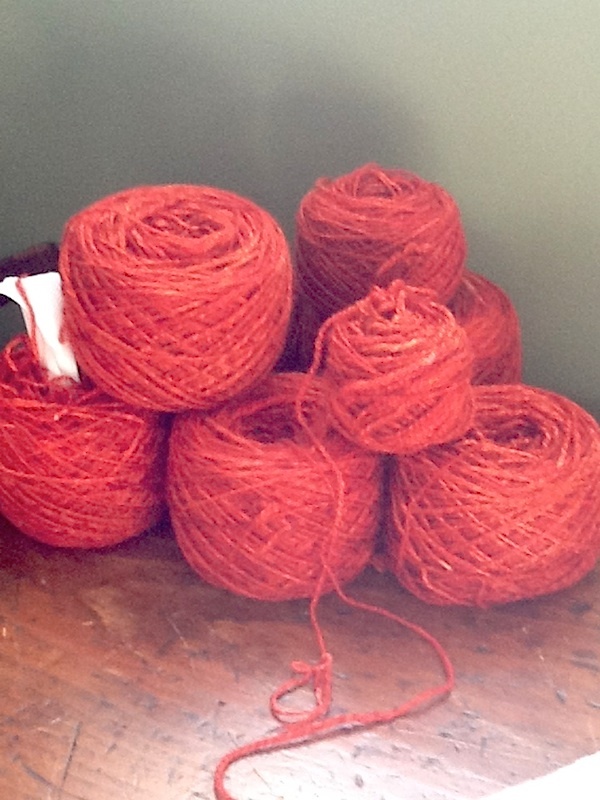 And Mum’s handspun luxury yarn came out a beautiful deep autumn blaze colour; I am so very, very pleased with it. We’re still not positive it matches the original colour card, but we like the colour it ended up, so we’re counting it a success. 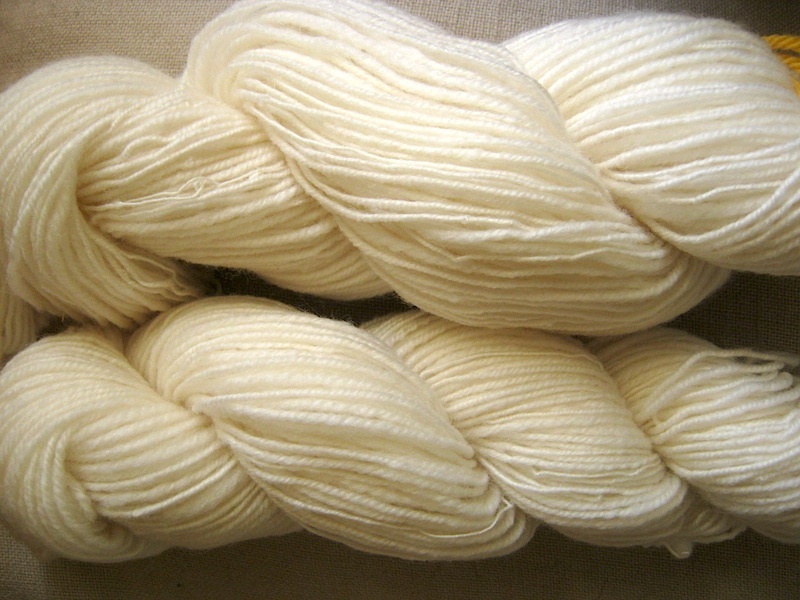 (You can’t tell the second batch of silk/cashmere was a buff instead of white at all.) I can’t tell you how hard it is to photograph this colour. It doesn’t help that the fiber content is about half silk, which messes with light reflection. The true colour is somewhere between the two photos. 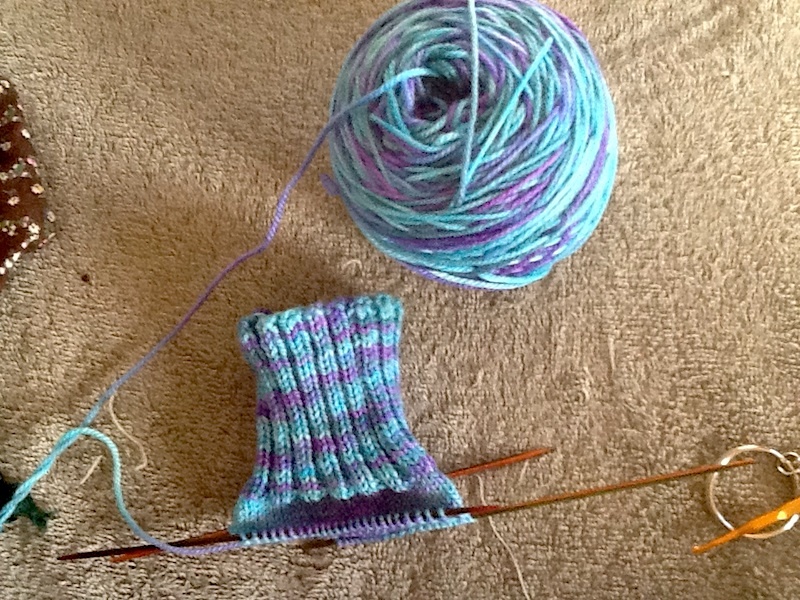 In the knitting column, I am knitting socks, my first really real socks for me, using the sock yarn Elina sent me in the summer of 2012, and they are looking like real socks so far. I wibbled about switching to stockinette, because I was tired of ribbing but I like the socks Elizabeth knitted for me last December, and they’re ribbed all the way down to just about to the ankle. I had two inches of ribbing, and figured any more would make me snap somewhere along the line, so I switched to stockinette. 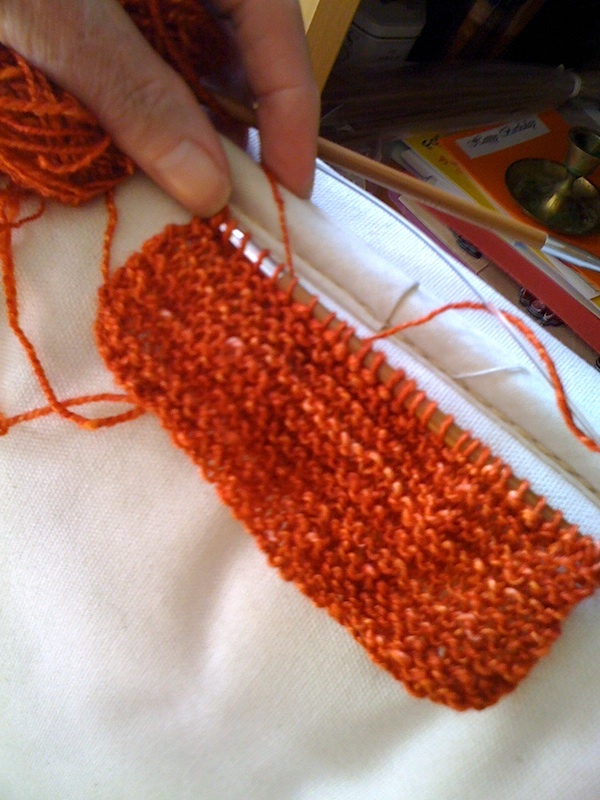 Except… I should have kept ribbing them, as much as I hate ribbing. Plain stockinette is not as quick as I remember it being (when did I get quicker at doing 2×2 rib?) and I prefer how the variegated yarn looks in the ribbing over the plain stockinette. Bah. Also, these pretty DPNs are teeny and I am bending them as I knit; I’m worried I’ll snap one, and sure, I have an extra, but still. And I need to loosen up my knitting, because I am so tense when I use these teeny needles, and the stitches are too tight. Meow, meow, meow. And I have a shawl problem. I have a lovely shawl pattern, but no yarn for it yet. And I have handspun yarn for shawls, among them this one, but can’t decide on patterns for them. Finally, I have yarn I spun for a shawlette, the pattern for it, and am paralyzed because I don’t think it will look very good in that pattern after all. I give up. And as a bonus, I am getting the itch to weave again,which entails emptying an awful lot out of Owlet’s cupboard to drag the loom out from under the stairs. I have no idea what I want to make; I just want to be weaving. Because I have so much spare time, of course, and nothing to fill it with. This entry was posted in Diary, Knitting, Spinning, & Weaving, Links, Photographs, Words Words Words on October 9, 2013 by Autumn. We held our annual Canada Day concert as part of the Pointe-Claire Canada Day celebrations last week. It was really, really good. Having brass and percussion certainly kicks things up a few notches, and also relieves some stress. After dress rehearsal, some of the cello section laughed about how we no longer felt the need to practice like crazy to try to polish the last little things, because no one would be hearing them anyway. In all seriousness, though, I’m happy with how I did considering the lack of time I had to practice this material. We’ve played the Capriol Suite by Peter Warlock before (twice, I do believe) but in the arrangement for string orchestra. This time we had the percussion and a BRASS SECTION (it deserves capital letters because it was VERY THERE) and it totally changed the feel of it. Also, it was a more aggressive interpretation on the part of our conductor, so all in all, a very different piece. I enjoyed the Tchaikovsky waltz from Swan Lake (also much more energetic than I’d expected), and as it was Canada Day and a dance-themed concert, we naturally played Strauss. I grumble about Strauss, but playing through waltzes gives me a much more refined appreciation of them. This year’s was Tales from the Vienna Woods, and we also did the Thunder and Lightning Polka, which was deliciously rollicking, crashy and loud thanks to the percussion, and a lot of fun. We played some Dvorak Slavonic Dances to end the concert, and while at times I think Dvorak orchestrated these with particular attention to trying to kill cellists, they do sound fabulous. I can’t even imagine not owning a cello. Playing on a borrowed instrument and not being able to allow yourself to make as deep a connection as you want to must be incredibly difficult. And yet, that’s the position my friend Emily has been in. She’s a professional cellist and teacher, and a year ago she was forced to sell her cello in order to make ends meet. We’re talking a totally different bracket of cello, here. Selling mine would maybe net me a grand. Emily’s… well, let’s just say it was a heck of a lot more than that. But in selling it, she also sold a friend, a companion, an instrument that had been with her for the entirety of her professional life, and most of her student life, too. And while a colleague lent her a cello so she could continue to work, she was missing… well, she was missing a soul mate. Henri is a 1938 French cello with dreamy, rich sound. He and Emily fit together beautifully. And she’s asking for help from friends and strangers in raising the last of the money she needs to buy him. In typical Emily fashion, her way of thanking sponsors is to give back to the community by working with charities, veterans, public schools, and various assistance programs. There are fun personal thank-yous, too — Emily’s quirky stick figure drawings, copies of her quite excellent cello technical manual, and so forth — but Emily’s all about giving back at large, and outreach. It’s no surprise, because she has an enormous heart and sense of justice, and she values everyone and everything. So when HRH asked me what I wanted for my birthday this year, I really thought hard about it. Did I want a gift certificate to the local spinning supply studio, and a free afternoon in which to visit it? Did I want a pair of hand carders? Did I want books? And then I knew. HRH is donating money to Emily’s fundraising campaign as my birthday present. Because I know that Emily and Henri are meant to be together, and because I know what it’s like to own your instrument and be able to allow yourself to fall in love, to make that deepest connection. And if I know that on my own superficial, amateur level, then I can only imagine what it’s like on Emily’s professional level. To be a professional musician without an instrument… it’s unthinkable. And I’m happy to be able to direct my husband’s birthday present to me towards a friend’s need, and know that many, many people will benefit by it in the long run. Her fundraiser can be found at http://www.indiegogo.com/projects/stark-raving-cello-fundraiser. Here’s an interview by Zero 2 Maestro with Emily about her situation. This entry was posted in Cello, Links, Music, Weather, Seasons, & Celebrations, Words Words Words on July 9, 2013 by Autumn. The boy was home again yesterday with a bockety digestive system. We shooed him off to school today with lots of encouragement. I’ve been really slow to pick up on podcasts. I spend most of my time at a computer working with words, and listening to words while I do it distracts me. I can’t follow both trains of thought at the same time without failing at both, which not a model of efficiency. On top of that, if I want information, I’ll read about it; it’s a lot faster. But I discovered the SpinDoctor podcast last summer, and I love it. Sasha, the host, started spinning at just about the same time I did, so we’re around the same level. She reviews things I’m interested in, like DVDs and books and fibre and equipment, and things I’ll probably never experience like the huge fiber festivals, and I like her personality. I generally listen to it while I spin (what better time?) but I haven’t been spinning much lately. There’s been a boy home or work to do or I’ve been knackered by fibro, and to be honest, this yellow Polworth is taking forEVer to spin up as laceweight. (We’re talking a single of about 54 WPI, on the fastest setting of my Louet S15, which is a ratio of about 10:1.) I split the four ounces into two parts to spin a two-ply yarn, and I’m so close to finishing the first half. When I am, I suspect I will stuff it in a bag and spin something else before I start the second half, because I’m so tired of it. I’ve spun all of one ounce of Merino before this, and I find the Polworth very much like it. I really prefer BFL and silks to the Merino kind of sponginess, I have discovered. Longer, silkier fibres are my thing. I don’t know how to explain my liking for Corriedale or Coopworth, then, but there you are. Anyway. I have discovered that with the weather so cold, I can’t read books, either paper ones or ebooks, while waiting for the boy at the bus stop in the afternoon any more. Enter the podcast! I can stand there and watch for the bus, hands warmly ensconced in mitten, and listen to a bit of an interview or review or whatever. I’m still not a huge fan of podcasts in general. I find I need to be doing something that doesn’t require a lot of attention in order to listen, and that’s a tall order when I’m fighting fibro fog a lot of the time because the fog demands that I focus all that I’ve got on what I’m doing like cooking, baking, writing, editing, what have you. The car may be a good place, but I don’t have a widget that allows me to plug my iPod into the stereo. On top of that, while I may find a segment interesting, it’s rare that I’m always interested in all the information a podcast covers so I get impatient or bored quickly. I’ve sampled a few here and there, and a lot of the time I find an episode is too long for what it should be. I have some podcasts I’ve been meaning to listen to or try out, especially ones by friends or acquaintances, but for the above reasons I just don’t get around to it. Part of me wants to, and part of me just sighs at the amount of investment it takes in time and energy. I’ll get around to it someday. This entry was posted in Cyberspace & Technology, Diary, FM/CFS, Knitting, Spinning, & Weaving, Links, Words Words Words on December 10, 2010 by Autumn. Cello fell apart last week. I don’t mean literally (you’d have heard me screaming from wherever you physically are, I suspect) but figuratively. Nothing I played worked. Everything was disjointed, scratchy, jerky, lousy phrasing, no dynamic control, horrible intonation (why E flat major as C minor, why, WHY? )… every time I tried it got worse instead of better. Which is, if you think about it, the exact antithesis of what practice is supposed to do. One of the general bits of wisdom floating around is that you shouldn’t repeat mistakes, so if things are going wrong and you can’t isolate why and fix them, stop and come back later. Except every time I came back it was worse. Friday night I sat down, gritted my teeth, put the Suzuki accompaniment CD on and played the Gavotte at the ridiculous speed it called for. And I did it again. And again. And again. I didn’t stop, I didn’t pause to fix things, I didn’t listen critically, I just played it. And I played it at a speed that was far faster than I’d worked it before, faster than my target metronome marking. And then I put the cello away. Saturday morning I went to my lesson. We warmed up with my lines in the pretty arrangements of Silent Night and Greensleeves that we’re playing, then my teacher said there was half an hour left and she didn’t think we needed half an hour for the Bach, so why not look at the Bazelaire she’d given me for the next recital? And we played through the first half of the first movement, working on the wacky thumb-index-index pizzicato movement, and it was so much fun. Then we turned to the Bach. I kind of gritted my teeth again, then took a steady breath, threw all my feelings about it away and started. And it flowed, and had phrasing, and drove right on to the end. When I was finished I started to laugh, and my teacher exclaimed and asked where that had come from, and she even made me stand up and take my Suzuki bow. Apparently running a piece at ludicrous speed seven or eight times in a row to recorded piano accompaniment is a good thing. I didn’t even play it through again, or look at trouble spots; it didn’t need it. I drove home and had a quick lunch. Then the boy and I bundled into the car and drove to the local movie theatre to meet with his best friend from preschool and her mom to see Tangled together. It was so much fun. Granted, listening to Zachary Levi for an hour or so was part of that, but the design, the palette, the characterization, the execution, the pacing and plotting, and the songs and score were all fantastic. (I’d sneaked a listen to some of the songs released earlier that week on various music and film blogs, and had in fact purchased the soundtrack two days before the film, so I knew about that last bit ahead of time!) It has firmly settled itself among my top three favourite Disney films, and very possibly has bumped Beauty & the Beast out of my #1 spot. I can’t make a confirmed judgment as to that yet, because I’m going to need to see it a few more times first. We’ll certainly go see it at Christmas when we visit my parents, because Mum wants to see it and HRH needs to see it, too. The boy’s friend came over to our house to play for an hour and a half after the film. I made peanut butter chocolate-chip cookies, they played with his trains, and at some point they ran through the house playing cowboys & knights, one waving the wooden sword and shield HRH made and the other with a Nerf gun. It was great. Her mom picked her up and I headed into Montreal for my piano rehearsal scheduled for 5:20, where we each play our solo pieces with the accompanist. Despite giving myself forty-five minutes to get to NDG I hit bad traffic and was ten minutes late, but things were running behind anyway. I got to listen to everyone’s pieces and their work on the timing or the trouble spots, applauding with everyone else enthusiastically after each. And then, like the Farewell Symphony, they all left one by one as they were done; I was last, with an audience of only my teacher and the pianist. And I kicked my Gavotte again from start to finish. I was very pleased with it. We didn’t need to work on anything or test timing or cues; I loosened my bow and that was that. I’m feeling really confident now about next weekend’s recital. I got home in time to read to the boy in bed. That night HRH and I ended up clearing out the storage room because I was looking for something. We moved some stuff into the laundry room and emptied at least three big boxes. It’s much easier to locate things now. Ironically, though, we didn’t find the box I was looking for. Sunday was my day at the Yule Fair. I was scheduled to do a talk with Ellen Dugan on green magic and magical gardening, and she was so fabulous. We had a blast. I got to touch base with Chris Penczak and Judika Illes again, too, and pick up a couple of books. I so love working with other authors at these kinds of events. And it always comes as a surprise to me when they say they’ve read my stuff and are impressed, or refer to a concept I’ve discussed somewhere. I had some wonderful discussions with people who came to my signing afterwards, too, and was very touched by some of their stories about what my books have done for them. HRH and the boy came downtown with me and took the metro to see the Christmas window at Ogilvy’s, which was unfortunately half non-functional, before having lunch out together. We had to leave the fair and get back home for mid-afternoon because I was possibly expecting a drop-off. It didn’t happen, however, and good thing; both HRH and I were coshed by a really, really bad cold and fell asleep while the boy watched movies. I’d felt the beginnings of it when I’d woken up in the morning, but a couple of Tylenol took care of the aches and sore throat for a few hours. I was stunned at how brutally it hit me mid-afternoon, though. This entry was posted in Art, Theatre, & Film, Cello, Diary, Links, The Boy, Words Words Words on December 8, 2010 by Autumn.